Born in Bethlehem, Called a Nazarene? One of the most secure facts about Jesus from New Testament is that he was “from Nazareth in Galilee.” If he was the Messiah, son of David, why was he not “from Bethlehem?” As the readers of Matthew and Luke, we know he was born in Bethlehem and some of the reasons why he did not stay there. 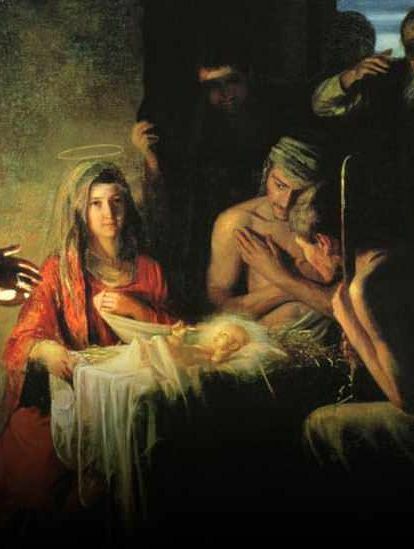 But as with everything in the story of Jesus’ birth, there is more to the story. Political and economic issues in first century Palestine are the main reasons that Joseph moves from Bethlehem to Nazareth. Just like laborers today, You go where there is work! Sepphoris and Tiberias, two large cities near Nazareth, had need for stone cutters and other craftsmen. Joseph went to Nazareth there because there was work in the area. Bethlehem was a minor town which probably supplied sheep for the Temple. Perhaps after the census there was simply no way for Joseph to support his growing family so he planned to return to Nazareth where there was family and work. Matthew has a more theological explanation. He quotes the prophet Hosea: out of Egypt I called my son, he is a Nazarene. Only in Matthew we are told that Herod intended to kill baby boys under the age of two in Bethlehem in an attempt to stop the Messiah from taking his throne. This “slaughter of the innocent” is analogous to killing newborns in Egypt in the book of Exodus. This leads to the “flight to Egypt,” although we are not told how long they remain in Egypt before returning to Galilee. This fulfills the word of the Lord through Hosea, according to Matthew 2:14-15. While this does not seem like an appropriate use of the verse, the idea in Hosea is that Israel is God’s child who has taken refuge in Egypt, and after a period of time in Egypt he would be recalled back into the land of promise. Hosea is looking back at the story of the Exodus, where Israel was in Egypt for their protection and are called out of Egypt in order to enter the land. Jesus is, in a very real sense, the Son of God. In another sense, Jesus is re-enacting the experience of Israel by fleeing from the land to Egypt and returning again at the direction of God. There are a number of parallels to the experience of Israel in the gospels, for example, he too will be tempted in the wilderness; on the cross Jesus takes the curse of the law on himself and pays for the nations rebellion himself. That the family should settle in Nazareth fulfills another scripture for Matthew (2:21-23). This is a bit more problematic since there is no specific text which says that the messiah should be called a Nazarite, or as the NIV translates, a Nazorean. Nazareth was another extremely small, insignificant village, so it is unlikely that a Hebrew prophet would have predicted that he would come from this town, especially since the messiah was to come from the town of David. It is possible that the phrase does not mean that he would come from the town of Nazareth, but rather that he would be a Nazarite, someone who has taken a Nazarite vow. But again, no scripture really says that the messiah would have taken a Nazarite vow. Another possibility is that the line in Matthew refers to Isaiah 11:1, which says that the messiah will be a “root from the stump of Jesse,” or a branch. The Hebrew word for root / branch is nezer, and Matthew is making a play-on-words with the name of the town (although these are two different words). Another possibility is that Nazarene was slang for a person from a remote place (Blomberg, Matthew, NAC, 69 suggests this). Perhaps it is like saying that someone is from “Hickville.” Most regions have an “other side of the tracks,” Nazareth was proverbially on the wrong side. Whatever the reason he was called a Nazarene, the title points to humble origins. As with his birth in Bethlehem, Jesus’ time in Nazareth is an indication that God will do great things through the Messiah who is hidden, who is small and insignificant at first (Matt 13:31-33). I first had encountered the idea of the killing of infants in the Birth narrative being “analogous to killing newborns in Egypt in the book of Exodus” this morning when I was watching a Documentary on how Christianity is false. This thought was used to defend the position that the story of Jesus of Nazareth in Mark (and the following Gospel accounts) was entirely a story of analogy and metaphor. This post simply reminded me of that moment, sitting in my living room, when I thought about the great schism in thought between the ‘Christian’ and the those that find the Bible to be poor in regard to historicity. The same truths that cause me to worship our sovereign Lord Jesus are often the same ideas that cause others to reject the Bible because it works too well as a single narrative. The great ideological divide is not as black and white as it always appears. It is, likely more often than I realize, a matter of perspective more so than interpretation. I appreciate the great amount of work that you put into these posts, Dr. Long. Or perhaps you are so good at this point that you can push these out before your first pot of coffee.